Medicare can be confusing. Let me educate you, so you can make an informed decision. »There is no charge for my services. Are you turning 65 this year? Do you know all you need to about Medicare? Are you ready to take advantage of everything Medicare offers? Are you confused about the Medicare Plan D drug plan? Do you find the maze of Medicare options confusing? If you answered yes to any of these questions and have ever wondered about what Medicare benefits you may qualify for, I can help at no additional cost for my services. Hi, I’m Douglas Kerr, licensed agent and United Healthcare Advisor (CA Lic #0G64783), and I want to help you save money today. With my knowledge and experience, I help people understand how Medicare insurance works and can recommend the proper Medicare Plan for you. I will simplify your Medicare insurance decisions at no cost to you because my services are paid for by United Healthcare. I can help you understand all your Medicare options and help you find the best plan for you. Again, my services cost you nothing. Medicare is a great start, but it doesn’t cover everything. For example, it pays only 80% for its covered expenses. The rest comes out of your own pocket. Even if you are still working or retired and are covered by your company’s health plan, you are probably paying something every month. Now that you are about to turn 65, there is a Medicare Advantage Plan where the monthly premium is $0. There are other options that have lower premiums than most company insurance plans. So, if you are close to your 65th birthday, you need to act quickly if you want to avoid having to wait for the annual enrollment period. If you contact me I can give you the details. Call me today (760) 473-7721 so you can understand the Medicare requirements and have the best coverage available that meets your needs. I would be happy to meet with you one on one at your home or a convenient location of your choosing. I specialize in helping simplify Medicare Advantage Plans and what they are all about. I also work with United Healthcare Supplemental Plans. With my knowledge we can recommend the proper United Healthcare/Secure Horizons Plan for you. We will take the time to make sure you understand all the options and make sense of how the drug plan (Part D) works. Douglas Kerr is a United Healthcare Advisor who works with United Healthcare/Secure Horizons Medicare Plans. 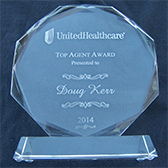 He won the United Healthcare San Diego Top Agent award for 2014. Doug became involved in Medicare after helping his parents and his wife's mother navigate through all the choices and confusion of choosing a Medicare Advantage plan. 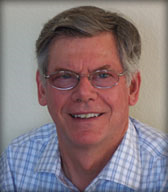 He is a member of the Encinitas Rotary club, the Encinitas Chamber of Commerce and has lived in Encinitas for 28 years. Why go through a local agent? I am your personal representative, I will give you individual attention, I will touch base with you throughout the year, I do a third quarter review of your drug costs with strategies on how to avoid the donut hole and I have the ability to be an advocate on your behalf. All this at no additional cost! If you are part of Senior group, large or small, Doug does Educational Medicare update presentations for groups - give him a call to arrange a presentation.